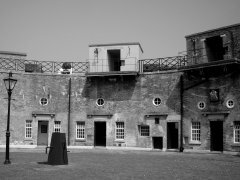 Nothe Fort in Weymouth, Dorset is situated on the shore beside the northern breakwater of the ex-military Portland Harbour, and at the mouth of civilian Weymouth Harbour. 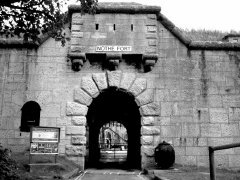 Nothe Fort was built in 1872 to protect Portland's harbour, which was then becoming an important Royal Navy base. 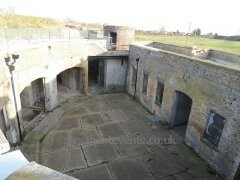 The fort played an important role in World War II, when the harbour was used as base by the British and American Navy. 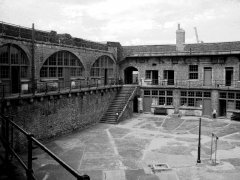 In 1956, the fort was abandoned, and in 1961 it was purchased by the local council. 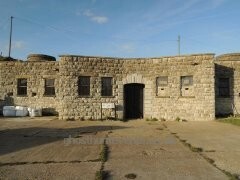 It is now a museum and tourist attraction, featuring models, World War II memorabilia as well as original cannons and guns and British and American WWII vehicles. 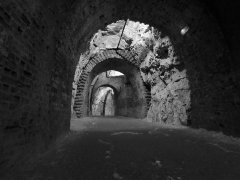 Nothe Fort has always had a legendary ghostly whistling gunner and many people claim to have heard his eerie whistling in the Fort's extensive underground passageways. 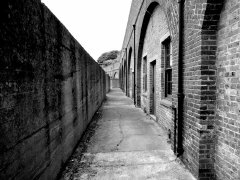 Tales of this phantom have been talked about for decades around Weymouth and the Fort affectionately has a passageway dedicated to him. Who this 'shade' actually is, is at this time, unknown. 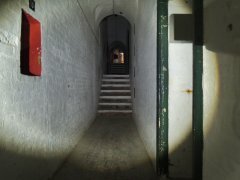 A survey carried out in 2007 by The National Lottery discovered that the Fort was voted one of the spookiest locations in the UK; in fact staff members sometimes refuse to visit certain areas by themselves.